PROPERTY and construction firm Mitrajaya Holdings Bhd, which posted record revenue and profit last year, expects to maintain or perform better in the current financial year ending December 31 2010. This would be driven equally by the group's ongoing property and construction projects, managing director Foo Chek Lee said. "To date, the group's combined order book value for construction and property development projects is nearly RM300 million," he told Business Times after a shareholders' meeting in Subang Jaya, Selangor, yesterday. "We will continuously bid for projects, both in the private and public sector, and we aim to secure between RM200 million and RM300 million worth of projects," Foo said. 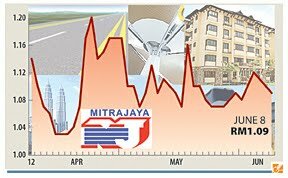 In the year ended December 31 2009, Mitrajaya posted RM45.5 million in net profit on revenue of RM326.3 million, up from RM2.1 million and RM195.3 million, respectively, in 2008. Foo attributed last year's strong performance to stable prices of construction material and fuel and its ongoing property development projects. Meanwhile, the group's overseas project called the Blue Valley Golf and Country Estate in South Africa, which has a gross development value (GDV) of RM400 million, will be completed in five years. On the local front, Mitrajaya's three property projects in Puchong and Mont Kiara - Desa Idaman, Lavender Terraces and Kiara 9, which have a combined GDV of over RM500 million, are expected to be completed by early next year. They will start contributing to the group's bottomline in the current financial year. Mitrajaya has also clinched construction deals in Johor's Iskandar Malaysia, comprising of a RM64 million contract for the Newcastle University Medicine Malaysia Campus and a RM40.3 million deal for the car parks at the theme park. Foo also said he is upbeat about the current year, especially with the rollout of construction projects under the 10th Malaysia Plan as well as the strong demand for properties priced under RM1 million. And while the proposedrise in the foreign workers levy may bring additional cost to the group, it will not constitute a major portion of the group's cost, he added. SUNWAY Damansara Sdn Bhd, a unit of Sunway City Bhd, has launched Sunway Rymba Hills, a RM270 million gated and guarded residential project on 7.9ha in Sunway Damansara, Selangor. The joint venture project with Perbadanan Kemajuan Negeri Selangor comprises 80-units of 3-storey forest villas, SunCity said in a statement. There are four different designs with built up areas ranging from 4,259 sq ft to 4,650 sq ft. It claims to be the only residential development in Petaling Jaya with an exclusive 2.63ha private forest park. AXIS Real Estate Investment Trust (REIT) is buying two parcels of land for RM134 million. The leasehold land are in Telok Panglima Garang and Petaling Jaya in Selangor. The REIT also plans to place out up to 69 million new shares or about 22.4 per cent of its existing units. It also wants to increase its existing approved fund size from about 307.08 million units up to a maximum of 375.9 million units. MAGNA Prima Bhd and vendor Muafakat Baru Sdn Bhd have agreed to extend the deadline to seal a firm agreement on a land acquisition. The companies had agreed on a three-month extension till September 19 this year for the purchase of a 4.1ha of land in Kuala Lumpur, Magna Prima told Bursa Malaysia yesterday. Magna Prima is buying the land for RM57.93 million. MALACCA'S first six-star resort and spa will open its doors next week, following a RM140 million investment by timber group Sanbumi Holdings Bhd. The Philea Resort & Spa, claimed to be Asia's largest log resort, is located on a 5.7ha site in Ayer Keroh, Malacca. It was designed by Symbios Design Associates Sdn Bhd. Speaking at the preview of the resort on Monday evening, he said a thorough study had been done for two years involving concept and other details before Philea's construction started in August 2008 and was completed in May this year. The company plans to bring in tourists from Hong Kong, Taiwan and China via chartered flights four times a week. Philea consists of 180 Pavillion Villas, 19 units of Philea Suites and two units of Royal Villas. Each villa is uniquely designed, complemented with pine-log walls and a host of amenities. The resort will also have five in-house food and beverage outlets as well as a host of other facilities and services such as outdoor-landscaped swimming pool and a spa village which will be opening soon.